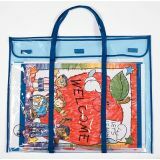 Clear vinyl bag holds bulletin board sets, charts, and more! Expandable and durable. 30" x 24". 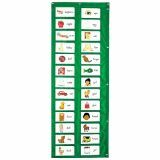 26 soft, pliable plastic pockets (each 5 1/2" x 3 1/2") for child safety and easy removal of flash cards. 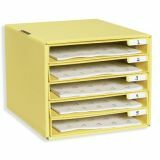 Top and left side edged with grommets to allow pocket chart to hang vertically or horizontally to hold all types of flash cards. 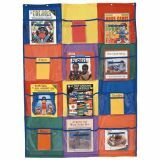 48" x 19"
Twelve 5" x 6" card pockets and twelve 12" x 12" book pockets. 37" x 511/2". 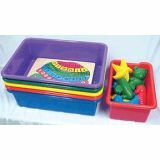 Strips, cards, and manipulatives not included. 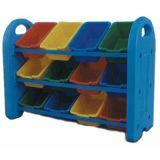 Use this 5 slot unit to organize the independent learning centers in the classroom. 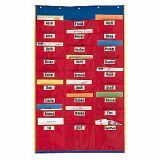 Each 12" x 10" x 1 1/2" slot has its own identification tab. Easy to assemble.12 1/4" x 11" x 9 1/4".